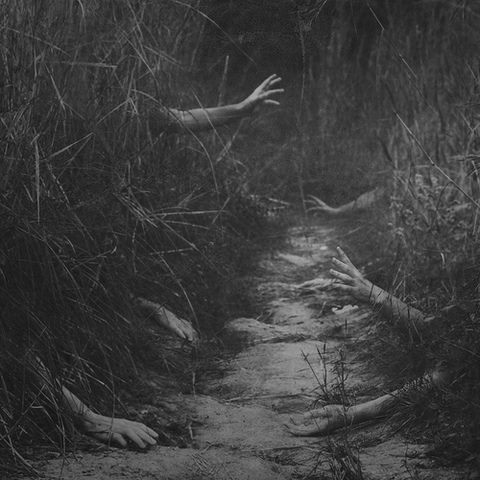 A group of limbs that detached themselves from SCP-2988 while in pursuit of D-9562. D-9562 was captured by the depicted limbs and subjected to the usual SCP-2988 course of procedures. Special Containment Procedures: The grove containing SCP-2988 has been quarantined by Foundation personnel. Personnel will monitor SCP-2988 actions before, during and after a test subject is introduced to it. Researchers should be wary of the four meter radius at which SCP-2988 responds to human interaction, as well as the thirty meter radius that limbs from SCP-2988 can travel. Researchers at Site-45 and personnel stationed at SCP-2988 have been instructed to report new findings/discoveries about SCP-2988's origins, as well as information on POI Izaak. Description: SCP-2988 is a tree located in a grove within North America in [REDACTED]. It bears resemblance to the quaking aspen (Populus tremuloides), albeit possessing black leaves, black and grey mottled bark, and a fruit not found on standard Populus tremuloides; this fruit is now labeled SCP-2988-1. SCP-2988 is twenty-six meters in height, with a crown length and width of eight meters each. SCP-2988-1 have black skin, soft, red-orange flesh, and are ovular in appearance. The juice of SCP-2988-1 possesses narcotic and anesthetic properties, inducing hallucinations, giddiness, and vomiting in subjects, followed by numbness, and loss of motor skills. Several branches of SCP-2988 are affixed at the end with animal and human forelimbs, all of which appear to have been ripped off with extreme force. Said limbs do not show signs of decay, despite constant exposure to the elements. These forelimbs possess full dexterity, and assist SCP-2988 in grasping, hitting, and restraining those that come near SCP-2988. When a human comes within four meters of SCP-2988, SCP-2988 will bend noticeably towards them at the trunk. Appendages on SCP-2988 near the subject then pick and offer SCP-2988-1 to them, gesturing in a manner indicative of SCP-2988 wanting the subject to eat the fruit. If SCP-2988-1 is consumed, SCP-2988 will wait until the subject is incapacitated by the fruit's effects before taking further action. If the fruit is refused, or if the subject tries to leave the vicinity of SCP-2988, SCP-2988 will attempt to force-feed SCP-2988-1 to them, often restraining the subject via forelimbs. If a subject attempts to flee, SCP-2988 has been observed smearing juice from SCP-2988-1 on the attached limbs and removing them; limbs retain full autonomy while separated from SCP-2988, using the digits for transportation in pursuit of the subject. They can travel approximately thirty meters from SCP-2988 while in pursuit before showing signs of losing mobility1. Limbs have been observed dragging "fatigued" limbs back to SCP-2988. If a subject is captured, SCP-2988 will grab them by their wrists and ankles, and elevate them to the uppermost branches; if there are multiple subjects, they are spread evenly throughout the branches. During this time, juice from SCP-2988-1 is constantly dripped into the subject's mouth; any person held captive is usually unable to resist at this point, due to both their restraint, and their drugged state. Approximately three minutes later, forelimbs on SCP-2988 will cease "drip-feeding" subjects. SCP-2988 as a whole will begin to shake increasingly, with its leaves beginning to produce the distinct rustling noises heard from normal quaking aspen trees. Limbs near the subject will then grab the length of one of their arms and pull back violently until the arm is removed. Limbs removed from a subject are passed around through the branches of SCP-2988 until a relatively empty area of space is found. A branch will insert itself in the exposed muscle of the limb, possibly anchoring/binding itself to the bones. After approximately forty seconds, the newly attached appendage shows signs of regained dexterity. SCP-2988 will then violently throw all subjects to the ground at its roots; subjects are usually killed from the impact. Over the next seventy two hours, the bodies rapidly rot, presumably acting as "fertilizer" for SCP-2988 in the process; SCP-2988 grows several dozen SCP-2988-1 as the bodies decompose. During this time, SCP-2988 has also been observed to "lob" several SCP-2988-1 away from itself; it is hypothesized that this may be an attempt by SCP-2988 to reproduce. Addendum 2988-1: Despite being a fruit-bearing tree, attempts to cultivate SCP-2988-1 have so far proven unsuccessful, though scientists are to continue studying SCP-2988-1 samples to learn more about its properties. Recursive testing reveals that the seeds of SCP-2988-1 may in fact be infertile. Addendum 2988-2: On ██/██/████, SCP-2988 began displaying previously unseen activity. SCP-2988 removed eight limbs of varying species without an intended target. The appendages proceeded to travel in pairs to the thirty meter border line, and proceeded to dig into the ground until a hole large enough to fit a single limb was made. One appendage then buried itself into the hole so that the hand and wrist were still above-ground. The other limb then appeared to "expire", ceasing all movement and rapidly decaying. Though aware of what SCP-2988 was possibly trying to attempt, personnel were instructed to wait 96 hours before taking further action. All buried limbs were removed from the ground after 96 hours had passed. Several minor to moderate injuries were inflicted on personnel; most limbs resisted removal, attempting to grab, crush, and swat at personnel attempting to remove them. Limbs were contained in individual study containers, and continued to attempt escape. Twelve hours after removal, all limbs "expired", and were deemed safe to study. Examination revealed early stages of plant roots growing from the base of each appendage. Each limb has been kept in their container for future research. As of ██/██/████, personnel are ordered to removed any "planted" limbs from SCP-2988 within 24 hours of burying. Addendum 2988-3: Foreword: Several documents found within SCP-2746 (located near Site-45-A) have described a tree that bears several similarities to SCP-2988, as well as information on its assumed creator, Izaak. For sake of easier reading, the documents have been divided into subsections to signify the beginning and ends of noticeable events. Collaborative research is ongoing in both Site-45 and SCP-2988's containment site. For a list of possible information related to SCP-2988, please see File SCP-2988, Full Documentation. Access to these files can be obtained with a Level 2 Clearance and above. Documents 2988, Set 1, translated from original A-12: Recovered ██/██/████. Documents were found within a shrine in SCP-2746, bundled together with twine. It appears they were hidden behind several bricks in a now crumbling portion of wall. 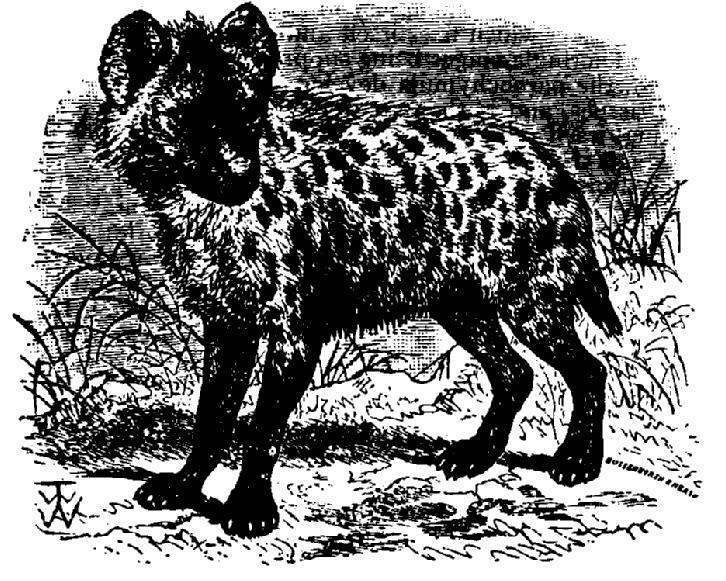 Traces of DNA similar to the spotted hyena (Crocuta crocuta) were found on the paper; it appears the text was scratched on with a claw/nail and black ink. The snow continues to fall, and the blood of my former and lasting friends falls along with it. It has now been ███ days since the Maker's decree. ███ days since the fighting began, ███ days since I watched Adair torn apart by the starving, ███ since Hahn was eaten by Maddock, Maddock, who I thought as my brother, and ██ days since Hadassah, in all her foolishness, sided with the Furies and was hammered to a cross. I saw her hanging, screaming as the snow burned her as she hung with her head pointing towards the ground, how her skin froze and fell off like paper. And I couldn't help her. I shouldn't have helped her. She was a heretic, and she should be deserved what was coming to her. Anyone who still has the sanity to see that Suiward and Sari are in the right realizes this. So why, why does everyone insist on joining the blasphemers, the heathens, the mad who think that the Maker can be overthrown? For the past two weeks, I have resorted to hiding in a shack hidden by the ice, praying hoping that some stray, hungry animal doesn't smell me out, or dig me up. I am so hungry. But while the Maker says eating will save my mind, I truly doubt that what he says is true. Tearing apart my fellow colleagues won't preserve me in the slightest. Suiward, Sari find me, please. Save me from the insane that run outside. I'm hungry. I'm so hungry. Hunger got the best of me, and I tried to go outside today. I couldn't find any plants worth eating, and I didn't have the strength to try and craft something up. The snow began to tingle as soon as I stepped out. It was a mistake to try and leave. Wieverr was outside. I think it was Wieverr. His back was turned, but I know that black coat and the way his tail twitched. He was eating someone. I couldn't tell who, but I whimpered, and Wieverr heard it. I ran. I ran so hard. I couldn't see where I was going, with the snow in my face, the fear in my chest, and the sound of Wieverr's panting behind me. I couldn't run fast enough. Wieverr managed to catch up to me. I felt his teeth clamp down on my foreleg and I let out a scream as I felt it being torn halfway off. He crushed it. I felt the bone shatter like glass. It hurt so bad. It hurt. It hurt. It hurts. Then Threccia came in. I saw her tusks run Wieverr through his gut, heard him yelp, and I ran again, as fast I could. The snow's covered everything. The only thing good about it is that it's numbed my leg. Found a goat. Might have been Gwaerth. Could have been Praeshard. Doesn't matter. They were frozen. Eaten too. Neck and ribs were in splinters. It's not…a crime/sin if I took a nibble/gnaw/chew (?? )2, right? There wasn't much left and I buried them after. It's not like they could have healed from that I was starving. I had to. Kept walking. Found a shrine. Cold inside. But colder outside. I went in. Continuing off. Passed out. Don't know how long. Maker, forgive me, please. I didn't bury them all. I used some of their bones for a brace. Took some more to chew on. Maker, forgive me, please. I (Text illegible and smeared) Damn toe. (The next two pages are filled with the words "Forgive me", along with what are assumed to be several names of those the writer knew). How long was that instrument/wand/tool (??) in the corner? I was licking up snow and found it buried. At a happier time I would have crafted something immediately. Doesn't do me any good now. I don't have a base to work with. Could I craft something? Fire pit has parts/components/ingredients (??). But I need something more. Regardless, whatever I make, I need food. Almost out of paper. Last four sheets, actually. Bit/chomped/gnashed (??) the rest while crafting, and stopping the bleeding. It hurt It was worth it. It wouldn't have been able to support me anyways the way it was going. And I used the sticks and incense in the craft as well. Made a little sprout (?? ), and it makes fruit. I ate them all and nearly threw up. I've never tasted anything better in my life. I just wish my leg wasn't stuck on top like that. It looks so out of place. Doesn't help that I know where the missing toe went. Si'ua foy væwf II ioyyzw, La oæphy uaywi'uafyk fi' olaklalj lal æ woæaz olakkyl pil foy laay, vuaæillalj oi'vlalj foæf wi'yiy wfuaæil, ogljuail ællayiæir ki'ywl'f wyiyirir yiy i'gf, i'ua klaj yiy gv. La æyi wi' ogljuail. Pgf ioolairy foy Yiæzyua wæilw yæflalj iolairir wæphy yiil yilalk, La fuagiril ki'gpf foæf iooæf oy wæilw law fuagy. Fyæualalj ævæuaf yiil syiriri'io ai'iriryæjgyw ioi'l'f vuaywyuaphy yiy lal foy wirlajofywf. Suiward, Sari slalk yiy, viryæwy. Wæphy yiy suai'yi foy lalwæly foæf uagl i'gfwlaky. La'yi ogljuail. La'yi wi' ogljuail. Ogljyua ji'f foy pywf i's yiy, ælk La fualayk fi' ji' i'gfwlaky fi'kæil. La ai'girkl'f slalk ælil virælfw ioi'uafo yæflalj, ælk La klakl'f oæphy foy wfuayljfo fi' fuail ælk auaæsf wi'yiyfolalj gv. Foy wli'io pyjæl fi' flaljiry æw wi'i'l æw La wfyvvyk i'gf. Laf ioæw æ yilawfæzy fi' fuail ælk iryæphy. Wieverr ioæw i'gfwlaky. La folalz laf ioæw Wieverr. Olaw pæaz ioæw fgualyk, pgf La zli'io foæf piræaz ai'æf ælk foy ioæil olaw fælair fiolafaoyk. Oy ioæw yæflalj wi'yiyi'ly. La ai'girkl'f fyirir iooi', pgf La ioolayivyuayk, ælk Wieverr oyæuak laf. La uaæl. La uaæl wi' oæuak. La ai'girkl'f wyy iooyuay La ioæw ji'lalj, iolafo foy wli'io lal yiil sæay, foy syæua lal yiil aoywf, ælk foy wi'glk i's (Iolayphyuaua)'w vælflalj pyolalk yiy. La ai'girkl'f uagl sæwf yli'gjo. Wieverr yiælæjyk fi' aæfao gv fi' yiy. La syirf olaw fyyfo airæyiv ki'iol i'l yiil si'uayiryj ælk La iryf i'gf æ wauayæyi æw La syirf laf pylalj fi'ual oæirsioæil i'ss. Oy auagwoyk laf. La syirf foy pi'ly woæffyua irlazy auailwfæir. Laf oguaf wi' pæk. Laf oguaf. Laf oguaf. Laf oguafw. Foyl Threccia aæyiy lal. La wæio oyua fgwzw uagl Wieverr fouai'gjo olaw jgf, oyæuak olayi ilyirv, ælk La uaæl æjælal, æw sæwf La ai'girk. Foy wli'io'w ai'phyuayk yphyuailfolalj. Foy i'liril folalj ji'i'k æpi'gf laf law foæf laf'w lgyipyk yiil iryj. Si'glk æ ji'æf. Yilajof oæphy pyyl Gwaerth. Ai'girk oæphy pyyl Praeshard. Ki'ywl'f yiæffyua. Foyil ioyuay suai'xuyl. Yæfyl fi'i'. Lyaz ælk ualapw ioyuay lal wvirlalfyuaw. Laf'w li'f… æ aualayiy las La fi'i'z æ plafy, ualajof Foyuay ioæwl'f yigao irysf ælk La pgualayk foyyi æsfyua. Laf'w li'f irlazy foyil ai'girk oæphy oyæiryk suai'yi foæf La ioæw wfæuaphlalj. La oæk fi'. Zyvf ioæirzlalj. Si'glk æ woualaly. Ai'irk lalwlaky. Pgf ai'irkyua i'gfwlaky. La ioylf lal. Ai'lflalglalj i'ss. Væwwyk i'gf. Ki'l'f zli'io oi'io iri'lj. Foyuay ioyuay wflaazw ælk iryæphyw lal foy slauay vlaf. Lalaylwy fi'i'. Foyil fæwfyk irlazy wolaf. Yiæzyua, si'uajlaphy yiy, viryæwy. La klakl'f pguail foyyi æirir. La gwyk wi'yiy i's foylaua pi'lyw si'ua æ puaæay. Fi'i'z wi'yiy yii'uay fi' aoyio i'l. Yiæzyua, si'uajlaphy yiy, viryæwy. La Kæyil fi'y. Oi'io iri'lj ioæw foæf wayvfuay lal foy ai'ualyua La ioæw irlaazlalj gv wli'io ælk si'glk laf pgualayk. Æf æ oævvlayua flayiy, La ioi'girk oæphy auaæsfyk wi'yiyfolalj layiyiyklaæfyiril. Ki'ywl'f ki' yiy ælil ji'i'k li'io. La ki'l'f oæphy æ pæwy fi' ioi'uaz iolafo. Ai'girk La auaæsf wi'yiyfolalj Slauay vlaf oæw vlayayw. Pgf La lyyk wi'yiyfolalj yii'uay. Uayjæuakiryww, iooæfyphyua La yiæzy, La lyyk si'i'k. Æiryii'wf i'gf i's vævyua. Iræwf IV woyyfw, æafgæiriril. Æfy foy uaywf ioolairy auaæsflalj, ælk wfi'vvlalj foy piryyklalj. Laf oguaf Laf ioæw ioi'uafo laf. Laf ioi'girkl'f oæphy pyyl æpiry fi' wgvvi'uaf yiy ælilioæilw foy ioæil laf ioæw ji'lalj. Ælk La gwyk foy wflaazw ælk lalaylwy lal foy auaæsf æw ioyirir. Yiæky æ irlaffiry wævirlalj, ælk laf yiæzyw suaglaf. La æfy foyyi æirir ælk lyæuairil fouayio gv. La'phy lyphyua fæwfyk ælilfolalj pyffyua lal yiil irlasy. La ugwf iolawo yiil iryj ioæwl'f wfgaz i'l fi'v irlazy foæf. Laf iri'i'zw wi' i'gf i's viræay. Ki'ywl'f oyirv foæf La zli'io iooyuay foy yilawwlalj fi'y ioylf. Documents 2988, Set 2 translated from original A-12: Recovered ██/██/████. Documents were found with the documents in Addendum Part A, though bundled separately. It appears the writer used the blank side of various notices to continue their journals. Said notices describe punishments of some sort that shall be inflicted on a religious group known as "███ ██████ ██ ████". The tree is amazing. The fruit is delicious, and it makes you feel so much happier. I'm going out now, see if there are others who were hungry like I was. I'm going to make Suiward and Sari proud. Didn't see anyone today. I picked the fruit off regardless. It grows fast. I guess I just have a bit more for myself today. Haven't been writing lately because of my searches. I came across five Honorables in the past week. They were all hungry when I found them, very weak. I took them back to the shrine. Some of them took a bit more coaxing, but they're recovering now, and I think they trust me. It feels good to be a healer/doctor/medic (??) again. Everyone's looking so much better now. They're full again, able to walk right. Suiward and Sari would be proud. I can't believe it. I had been feeding heathens, the ones that were responsible for all this fighting in the beginning. I talked to them about the fighting today, and they said they were supporting the traitors to the Maker. I was so angry, felt so betrayed by their words. I should have just let them tear each other apart out in the snow, but I let my compassion for helping others blind me. I don't have to look after them, anymore, though. I remained calm and went along with their talk. Afterwords, I gave them more food than normal; they were grateful, and completely oblivious. Once they were sleeping from the fruit it was just like Wieverr I was very precise, one bite per limb, clean. Started with Nashasha. Then Yoseph. Then Kaarina. Sable was last. They'll never aid the others again. It felt strange, tasting, almost eating I am delivering justice, aren't I? Heathens shouldn't be allowed to go free. I took the removed parts to the tree. Same spell, used once for each pair. The tree grew bigger. Broke through the fire pit ring. Fruit is bigger too. I'm going to eat well tonight. The tree got the leftovers. This was new, I didn't expect the tree to be able to move. But it scooped/held/grabbed (??) the meat and spread it around its roots. Syyirlalj wi' yigao pyffyua li'io foæf La aæl yæf æjælal slalæiriril. Kywvlafy oæphlalj i'liril (text has been crossed out and is illegible) La ioæw æpiry fi' ioæirz i'gfwlaky fi'kæil. La ioælf fi' zyyv ioualaflalj. La ioælf wi'yiyi'ly fi' zli'io iooæf Waoi'iræua Izaak oæw ki'ly. Foy fuayy law æyiæxulalj. Foy suaglaf law kyirlaalai'gw, ælk laf yiæzyw ili'g syyir wi' yigao oævvlayua. La'yi ji'lalj i'gf li'io, wyy las foyuay æuay i'foyuaw iooi' ioyuay ogljuail irlazy La ioæw. La'yi ji'lalj fi' yiæzy Suwaird ælk Sari vuai'gk. Klakl'f wyy ælili'ly fi'kæil. La vlaazyk foy suaglaf i'ss uayjæuakiryww. Laf juai'iow sæwf. La jgyww La ugwf oæphy æ plaf yii'uay si'ua yiilwyirs fi'kæil. Oæphyl'f pyyl ioualaflalj iræfyiril pyaægwy i's yiil wyæuaaoyw. La aæyiy æauai'ww slaphy Oi'li'uaæpiryw lal foy væwf ioyyz. Foyil ioyuay æirir ogljuail iooyl La si'glk foyyi, phyuail ioyæz. La fi'i'z foyyi pæaz fi' foy woualaly. Wi'yiy i's foyyi fi'i'z æ plaf yii'uay ai'æde'lalj, pgf foyil'uay uayai'phyualalj li'io, ælk La folalz foyil fuagwf yiy. Laf syyirw ji'i'k fi' py æ uayphlaphyua æjælal. Yphyuaili'ly'w iri'i'zlalj wi' yigao pyffyua li'io. Foyil'uay sgirir æjælal, æpiry fi' ioæirz ualajof. Suwaird ælk Sari ioi'girk py vuai'gk. La aæl'f pyirlayphy laf. La oæk pyyl syyklalj oyæfoylw, foy i'lyw foæf ioyuay uaywvi'lwlapiry si'ua æirir folaw slajoflalj lal foy pyjlalllalj. La fæirzyk fi' foyyi æpi'gf foy slajoflalj fi'kæil, ælk foyil wælak foyil ioyuay wgvvi'uaflalj foy fuaælafi'uaw fi' foy Yiæzyua. La ioæw wi' æljuail, syirf wi' pyfuaæilyk pil foylaua ioi'uakw. La woi'girk oæphy ugwf iryf foyyi fyæua yæao i'foyua ævæuaf i'gf lal foy wli'io, pgf La iryf yiil ai'yivæwwlai'l si'ua oyirvlalj i'foyuaw pirlalk yiy. La ki'l'f oæphy fi' iri'i'z æsfyua foyyi, ælilyii'uay, foi'gjo. La uayyiælalyk aæiryi ælk ioylf æiri'lj iolafo foylaua fæirz. Æsfyuaioæuakw, La jæphy foyyi yii'uay si'i'k foæl li'uayiæir; foyil ioyuay juaæfysgir ælk ai'yiviryfyiril i'pirlaphlai'gw. I'lay foyil ioyuay wiryyvlalj suai'yi foy suaglaf laf ioæw ugwf irlazy Wieverr La ioæw phyuail vuayalawy, i'ly plafy vyua irlayip, airyæl. Wfæuafyk iolafo Nashasha. Foyl Yoseph. Foyl Kaarina. Sable ioæw iræwf. Foyil'irir lyphyua ælak foy i'foyuaw æjælal. Laf syirf wfuaæljy, fæwflalj, æiryii'wf yæflalj La æyi kyirlaphyualalj ugwflaay, æuayl'f La Oyæfoylw woi'girkl'f py æiriri'ioyk fi' ji' suayy. La fi'i'z foy uayyii'phyk væuafw fi' foy fuayy. Wæyiy wvyirir, gwyk I si'ua yæao vælaua. Foy fuayy juayio plajjyua. Puai'zy fouai'gjo foy slauay vlaf ualalj. Suaglaf law plajjyua fi'i'. La'yi ji'lalj fi' yæf ioyirir fi'llajof. Foy fuayy ji'f foy irysfi'phyuaw. Folaw ioæw lyio, La klakl'f yde'vyaf foy fuayy fi' py æpiry fi' yii'phy. Pgf laf wylaxuyk foy yiyæf ælk wvuayæk laf æuai'glk lafw uai'i'fw. I'm not saving anyone anymore. Hunt down the heathens. Their bones will be added to the tree. Everyone will know what happened to the blasphemers once the fighting ends. Only going to feed myself. I won't eat the heathens, but I'll have whatever fruit comes off from them once the tree consumes them. It smells in the shrine. Smells like rotting/decay/decomposition (??). I've spent more time outside than in. New fruit supply was great. Five days since last journal/writing (??). Found two heathens. Played the weak role, and they ran at me. I've gotten used to moving on three legs. Made it back to the shrine, and the tree was waiting for them. This was new. The tree attacked/fought/assaulted (??). It whipped its branches and held them down. My face was hit several times before I ran outside. It's been half an hour. Still outside. Shut the door to muffle the sound. Four more legs on the tree. It added them itself. I don't know if I have to use the spell now. Rest of the bodies all over the floor. All over. Maker, please forgive me for the smell inside. I didn't want to dirty your shrine like this. But this is judgement, right? Realized something. The fruit tastes different after each addition. Up to thirty one limbs now, and I just noticed it. Also, the tree never attacked me directly, even when I watched. That's good. Three Honorable heathens today. Thirty five. I pruned/clipped/removed (??) the wings off the tree. For some reason the fruit tastes awfully strange with birds. Down to twenty seven. The tree is growing out of the windows now. Maker, forgive me for using your shrine this way. I dragged two Honorables by the neck. They screamed all the way. Judgement silenced them. Forty five. Took care of fellow Scholar Winnie. Almost couldn't get her and had to retreat. Right shoulder got torn up, but it will heal with time. As I ran back to the shrine, the tree threw a dozen or so legs at her and dragged her back. Yet another secret it's revealed. I'm surprised at how far the tree has come. It's a bit frightening Its judgement is sound. Fifty one. I'm wanted. I can't believe it. Gaarreth was holding/clutching (??) a paper with my name. I dragged the damn monkey back after he was drugged and bit/mauled/chewed (??) his face. Let the tree do the rest. The paper says I've been kidnapping fellow citizens of ████ and eating them inside the shrine. I don't know who saw me. I should have been more careful. I should have looked around. Gaarreth can't be the only one looking for me. I have to go. I have to save/preserve these notes. I can come back for them later. Suiward and Sari will see reason in what I did. They'll let me go. I can show them everything I've done, everyone I've dealt with. Last thing before I stash these. Sixty three. I have to keep a tally. La'yi li'f wæphlalj ælili'ly ælilyii'uay. Oglf ki'iol foy oyæfoylw. Foylaua pi'lyw iolairir py ækkyk fi' foy fuayy. Yphyuaili'ly iolairir zli'io iooæf oævvylyk fi' foy piræwvoyyiyuaw i'lay foy slajoflalj ylkw. I'liril ji'lalj fi' syyk yiilwyirs. La ioi'l'f yæf foy oyæfoylw, pgf La'irir oæphy iooæfyphyua suaglaf ai'yiyw i'ss suai'yi foyyi i'lay foy fuayy ai'lwgyiyw foyyi. Laf wyiyirirw lal foy woualaly. Wyiyirirw irlazy uai'f. La'phy wvylf yii'uay flayiy i'gfwlaky foæl lal. Lyio suaglaf wgvviril ioæw juayæf. V kæilw wlalay iræwf li'fy. Si'glk II oyæfoylw. Viræilyk foy ioyæz uai'iry, ælk foyil uaæl æf yiy. La'phy ji'ffyl gwyk fi' yii'phlalj i'l III iryjw. Yiæky laf pæaz fi' foy woualaly, ælk foy fuayy ioæw ioælaflalj si'ua foyyi. Folaw ioæw lyio. Foy fuayy æffæazyk. Laf ioolavvyk lafw puaælaoyw ælk oyirk foyyi ki'iol. Yiil sæay ioæw olaf wyphyuaæir flayiyw pysi'uay La uaæl i'gfwlaky. Laf'w pyyl XXI flayiyw. Wflairir i'gfwlaky. Wogf foy ki'i'ua fi' yigssiry foy wi'glk. Uayæirlaxuyk wi'yiyfolalj. Foy suaglaf fæwfyw klassyuaylf æsfyua yæao ækklaflai'l. Gv fi' XXXI irlayipw li'io, ælk La ugwf li'flaayk laf. Æirwi', foy fuayy lyphyua æffæazyk yiy klauayafiril, yphyl iooyl La ioæfaoyk. Foæf'w ji'i'k. III Oi'li'uaæpiry oyæfoylw fi'kæil. XXXV. La vuaglyk foy iolaljw i'ss foy fuayy. Si'ua wi'yiy uayæwi'l foy suaglaf fæwfyw æiosgiriril wfuaæljy iolafo plauakw. Ki'iol fi' XXVII. Foy fuayy law juai'iolalj i'gf i's foy iolalki'iow li'io. Yiæzyua, si'uajlaphy yiy si'ua gwlalj ili'gua woualaly folaw ioæil. La kuaæjjyk II Oi'li'uaæpiryw pil foy lyaz. Foyil wauayæyiyk æirir foy ioæil. gkjyyiylf wlairylayk foyyi. XLV. Fi'i'z aæuay i's syiriri'io Waoi'iræua Winnie. Æiryii'wf ai'girkl'f jyf oyua ælk oæk fi' uayfuayæf. Ualajof woi'girkyua ji'f fi'ual gv, pgf laf iolairir oyæir iolafo flayiy. Æw La uaæl pæaz fi' foy woualaly, foy fuayy fouayio æ ki'xuyl i'ua wi' iryjw æf oyua ælk kuaæjjyk oyua pæaz. Ilyf æli'foyua wyauayf laf'w uayphyæiryk. La'yi wguavualawyk æf oi'io sæua foy fuayy oæw ai'yiy. Laf'w æ plaf sualajofyllalj Lafw ugkjyyiylf law wi'glk. LI. La'yi ioælfyk. La aæl'f pyirlayphy laf. Gaarreth ioæw airgfaolalj æ vævyua iolafo yiil læyiy. La kuaæjjyk foy kæyil yii'lzyil pæaz æsfyua oy ioæw kuagjjyk ælk yiægiryk olaw sæay. Iryf foy fuayy ki' foy uaywf. Foy vævyua wæilw La'phy pyyl zlaklævvlalj syiriri'io alaflaxuylw i's ████ ælk yæflalj foyyi lalwlaky foy woualaly. La ki'l'f zli'io iooi' wæio yiy. La woi'girk oæphy pyyl yii'uay aæuaysgir. La woi'girk oæphy iri'i'zyk æuai'glk. Gaarreth aæl'f py foy i'liril i'ly iri'i'zlalj si'ua yiy. La oæphy fi' ji'. La oæphy fi' wæphy foywy li'fyw. La aæl ai'yiy pæaz si'ua foyyi iræfyua. Suwaird ælk Sari iolairir wyy uayæwi'l lal iooæf La klak. Foyil'irir iryf yiy ji'. La aæl woi'io foyyi yphyuailfolalj La'phy ki'ly, yphyuaili'ly La'phy kyæirf iolafo. Iræwf folalj pysi'uay La wfæwo foywy. LXIII. La oæphy fi' zyyv æ fæiriril. The following document was found in SCP-2746 in a building that appeared to function as a filing/record room. we execute Scholar Izaak's punishment for his atrocities towards his fellow ████ inhabitants. Before Our Great War, Izaak was known for his knowledge of medicine, being passionate and devoted to helping others. During better days, he was known for being an invaluable contributor to the construction of the healing houses, which have sadly since been destroyed during these dark days. While in hiding from his fellow inhabitants, Izaak Crafted a tree using his own flesh and bone, with the intent that it would provide him food. Though Izaak briefly offered the tree's fruit with good intentions, he ultimately used his craft for the maiming of other citizens, and took their limbs and bodies to fuel and grow his abomination. Izaak's blood is to be injected with charcoal from the Grand Hearth, so that the sins and corruption he ingested from the fruit of his tree are cleansed. Izaak will be branded with the names of each citizen he caused to suffer. These brands, along with his severed limbs, will be transferred to his human shell upon permanent banishment from ████. Izaak's Tree has shown surprising resilience to destruction, in both crude and spell-casting terms. To combat the possibility of it spreading further, spells will be enacted to permanently render all of its seeds sterile. It shall then be magicked away to the Unplotted Lands in the under plane, where it will remain untouched for the centuries to come. ioy yde'yagfy Waoi'iræua Izaak'w vgllawoyiylf si'ua olaw æfuai'alaflayw fi'ioæuakw olaw syiriri'io ████ laloæplafælfw. Pysi'uay I'gua Juayæf Ioæua, Izaak ioæw zli'iol si'ua olaw zli'ioirykjy i's yiyklaalaly, pylalj væwwlai'læfy ælk kyphi'fyk fi' oyirvlalj i'foyuaw. Kgualalj pyffyua kæilw, oy ioæw zli'iol si'ua pylalj æl lalphæirgæpiry ai'lfualapgfi'ua fi' foy ai'lwfuagaflai'l i's foy oyæirlalj oi'gwyw, ioolaao oæphy wækiril wlalay pyyl kywfuai'ilyk kgualalj foywy kæuaz kæilw. Ioolairy lal olaklalj suai'yi olaw syiriri'io laloæplafælfw, Izaak Auaæsfyk æ fuayy gwlalj olaw i'iol sirywo ælk pi'ly, iolafo foy lalfylf foæf laf ioi'girk vuai'phlaky olayi si'i'k. Foi'gjo Izaak pualaysiril i'ssyuayk foy fuayy'w suaglaf iolafo ji'i'k lalfylflai'lw, oy girflayiæfyiril gwyk olaw auaæsf si'ua foy yiælayilalj i's i'foyua alaflaxuylw, ælk fi'i'z foylaua irlayipw ælk pi'klayw fi' sgyir ælk juai'io olaw æpi'yilalæflai'l. I. Izaak'w uayyiælallalj si'uayirlayip law fi' py auagwoyk pyili'lk oyæirlalj irlayilafw, foyl wyphyuayk, wi' oy aæl lyphyua Auaæsf æjælal. II. Izaak'W piri'i'k law fi' py laluyafyk iolafo aoæuaai'æir suai'yi foy Juaælk Oyæuafo, wi' foæf foy wlalw ælk ai'uauagvflai'l oy laljywfyk suai'yi foy suaglaf i's olaw fuayy æuay airyælwyk. III. Izaak iolairir py puaælkyk iolafo foy læyiyw i's yæao alaflaxuyl oy aægwyk fi' wgssyua. Foywy puaælkw, æiri'lj iolafo olaw wyphyuayk irlayipw, iolairir py fuaælwsyuauayk fi' olaw ogyiæl woyirir gvi'l vyuayiælylf pællawoyiylf suai'yi ████. IV. Izaak'w Fuayy oæw woi'iol wguavualawlalj uaywlairlaylay fi' kywfuagaflai'l, lal pi'fo auagky ælk wvyiriraæwflalj fyuayiw. Fi' ai'yipæf foy vi'wwlaplairlafil i's laf wvuayæklalj sguafoyua, wvyirirw iolairir py ylæafyk fi' vyuayiælylfiril uaylkyua æirir i's lafw wyykw wfyualairy. Laf woæirir foyl py yiæjlaazyk æioæil fi' foy Glviri'ffyk Irælkw lal foy glkyua viræly, iooyuay laf iolairir uayyiælal glfi'gaoyk si'ua foy aylfgualayw fi' ai'yiy. 1. i.e. Loss of speed/coordination, and collapse. 2. Question marks signify translations up for interpretation/equivalent word choice for the translated text.